Carter has gone to stay with my contact person from Habitat for Humanity, but I still had more to do. I had this lightweight fabric left over from making a dustruffle for my bed a few years ago, and they were perfect for Carter, since he's getting an orange long-sleeved T-shirt. Then I received all these goodies in the mail for Carter and the Habitat girl. 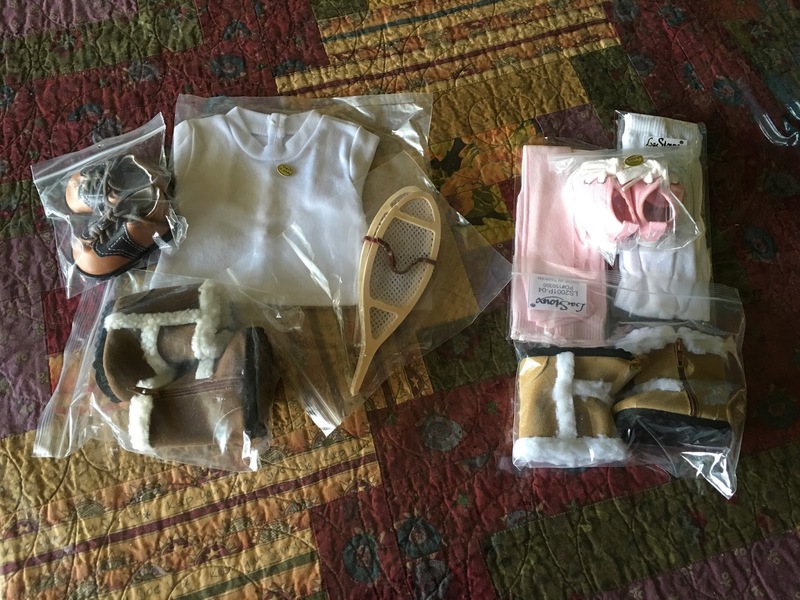 There were boots, dress shoes, a white T-shirt and snowshoes for Carter, and two pairs of tights, some sneakers and boots for the girl. Carter can't go snowshoeing in his overalls, slacks or shorts, so I made him some snow pants from the same felt as his jacket. In the meantime, Therapy Animals of Utah has asked me to dress a doll for them. Someone bought the doll and a trunk, and brought them to the picnic the organization had on Saturday. I need to make PJs and a warm jacket for Zoey, but otherwise, I think I probably have enough for her among what I've already made..
My yarn had dried, and I was able to get a photo of the skein. 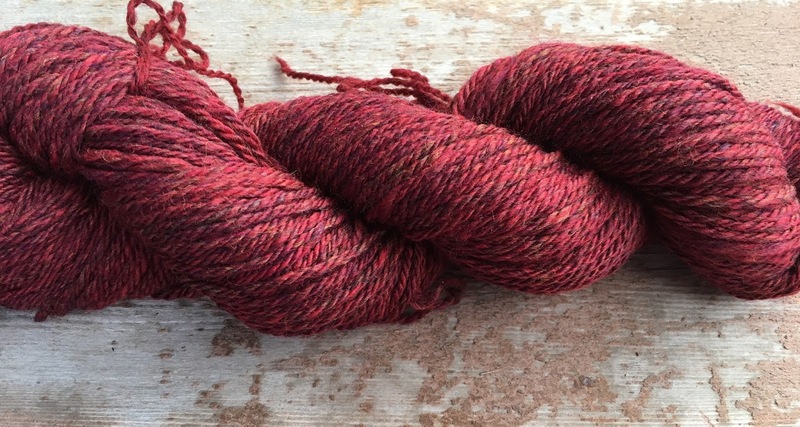 The fiber was from Woodland Woolworks Merino Combed Top Multicolor Mojave Heather. I Navajo-plied it. I ended up with 168 yds of 11 WPI (wraps per inch) and no waste from the 4 oz. This was for Tour de Fleece this year, but life got in the way in the form of camping with grandkids and the Habitat for Humanity’s silent auction projects. You may remember (if you read last week's blog post) that I'm helping one of my online friends start up a pattern company for making clothes for Götz dolls. I'm one of five people testing her patterns and the tutorials that go with them. I'm also editing and proofreading the tutorials for her. She just wants to get a couple more patterns ready before she opens for business. You can read about what she's doing and see some of the test projects (hers and those by the team of test-seamstresses) here. I'll post more information when she's ready to go public. Anyway, here's my rendition of her wrap dress, modeled by Vroni. It was tricky, because the fabric is almost a striped pattern, and I had to line up the stripes of tulips. It was easier on the back, because I put the center fold right down the middle of the tulips. The next pattern will be the leggings. I'm not used to working with knit fabrics, so this will be a challenge, but I've seen the prototype, and I'm excited. Meanwhile, I finished the "Gracie" for Mandy in Palette "Cyan" to go with the rather loose-fitting sleeveless dress I made her. While I was taking the photo, Vroni popped in to ask Mandy what she was looking at. I have a pink version of the Gracie Cardigan on the needles to go with the wrap dress. Vintage stitchers met on Thursday at my house. 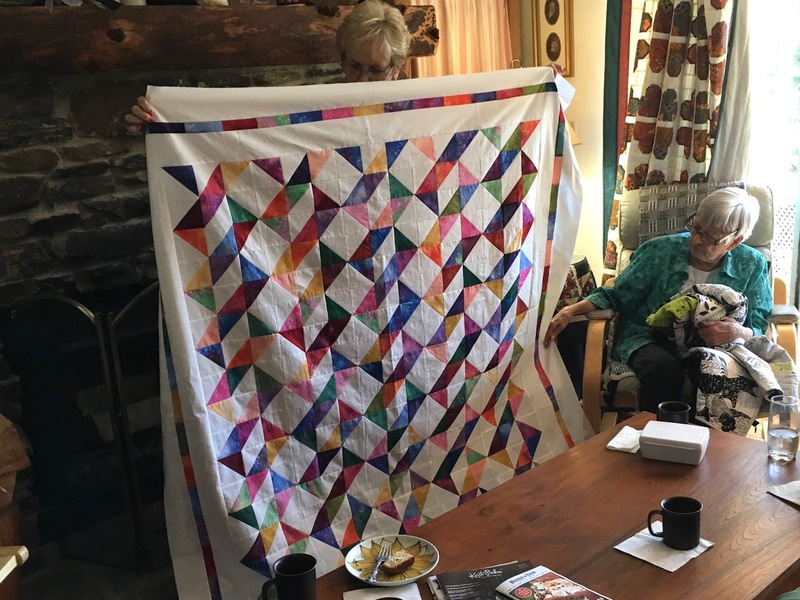 Barbara had finished this quilt top. It's an interesting arrangement of half-square triangles. 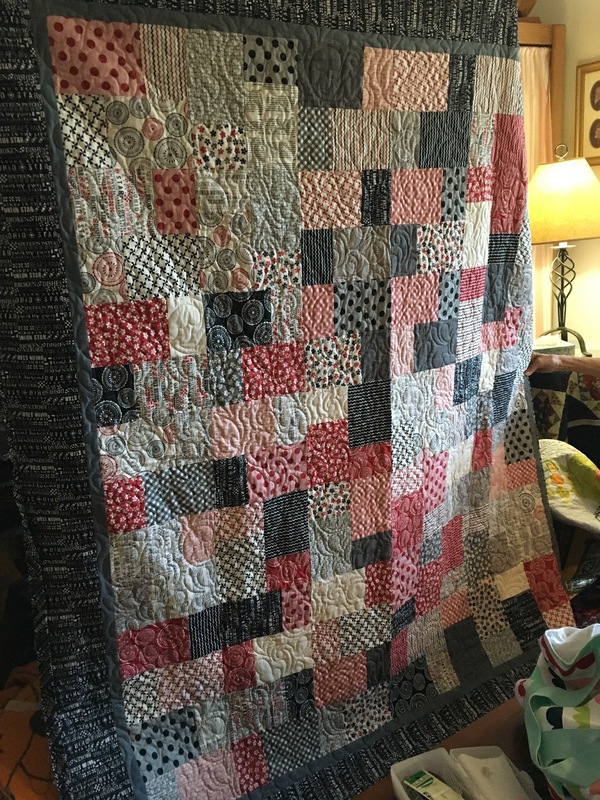 Brenda had finished this quilt. Julie had pieced this Winding Ways quilt top. She used a special ruler, but she said piecing the same pattern from die-cut pieces was faster. Diane is working again on this appliqué project she started years ago when she first started quilting. I was (still) hand-quilting my "Sistine Chapel" quilt, the Delectable Pathways. 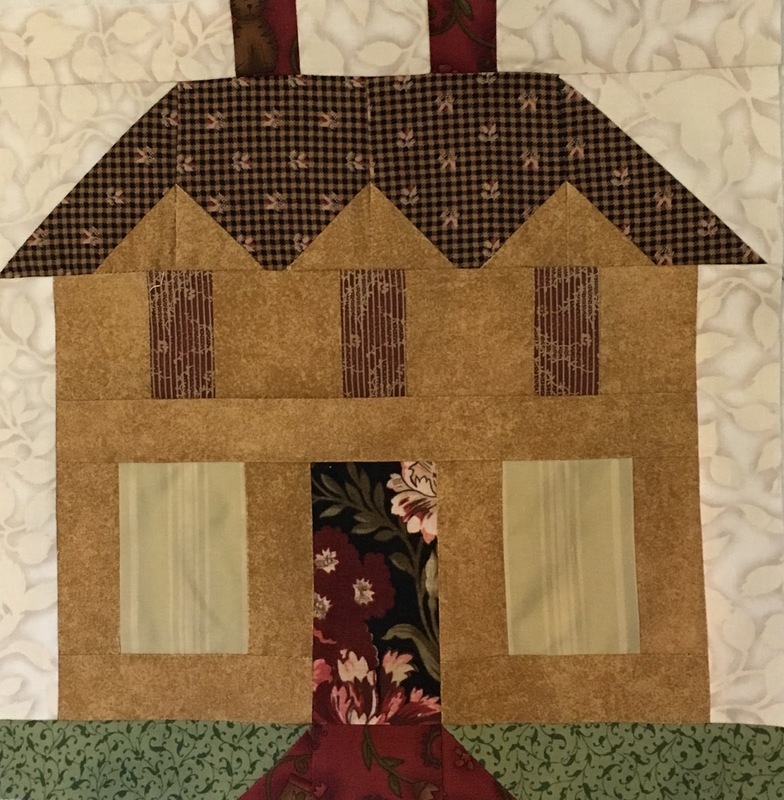 Also along the lines of quilting, several people knew I was working on doll clothes for Habitat for Humanity and offered to make quilt blocks. 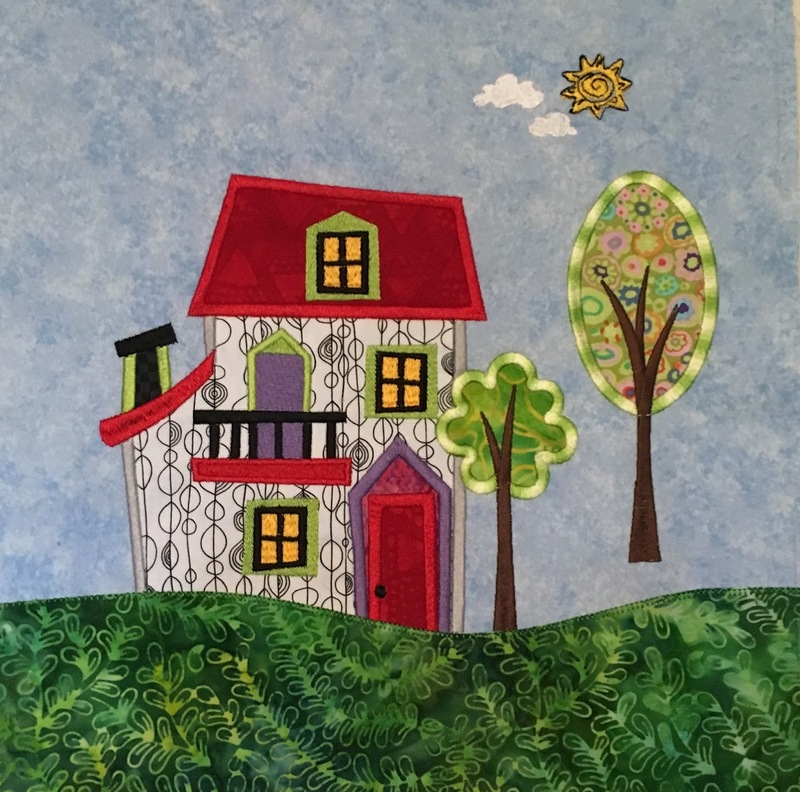 I suggested houses, any colors, and pieced, appliquéd or embroidered. The blocks need to be 12" finished, or 12.5" unfinished. I pieced mine on Saturday. Monday, as you probably know, was the big eclipse day. We were not in the path of the totality, and we didn't travel to be somewhere where we could see the full effect, but it was noticible even here in the mountains of northern Utah. The eclipse reached its greatest effect at 93% about 11:33 AM. 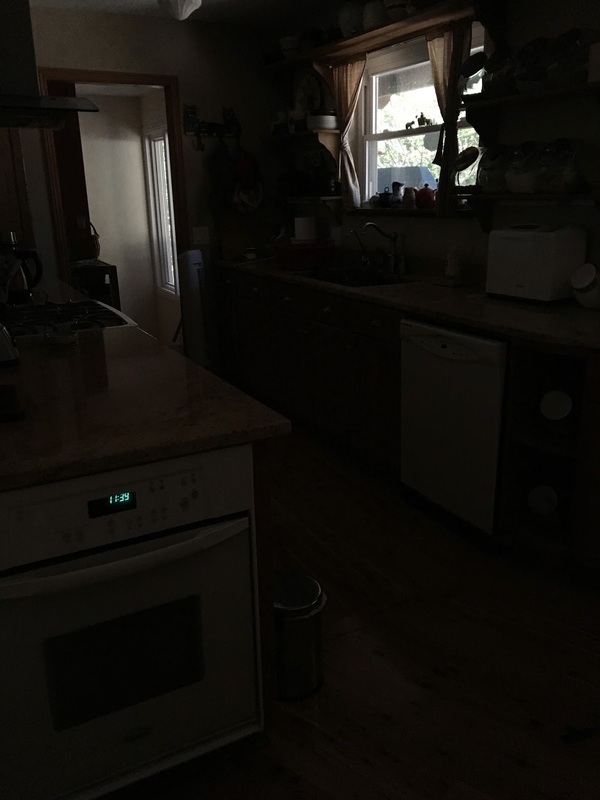 This was my kitchen a little after that time. You may notice that the clock on my baking oven reads, "11:39." That was when it seemed the darkest to me, and when I took the photo. The light-activated nightlights we have all over the house all went on, too. It was still light outside, but strangely dim for having a cloudless sky. The wildlife hid, including our squirrels and birds. The dogs followed me around as I went outdoors to view the eclipse with my special glasses and indoors to do other things. (As exciting as the eclipse is, the action isn't very fast.) The first hummingbird appeared about 30 minutes after the darkest point, and then things went back to normal. 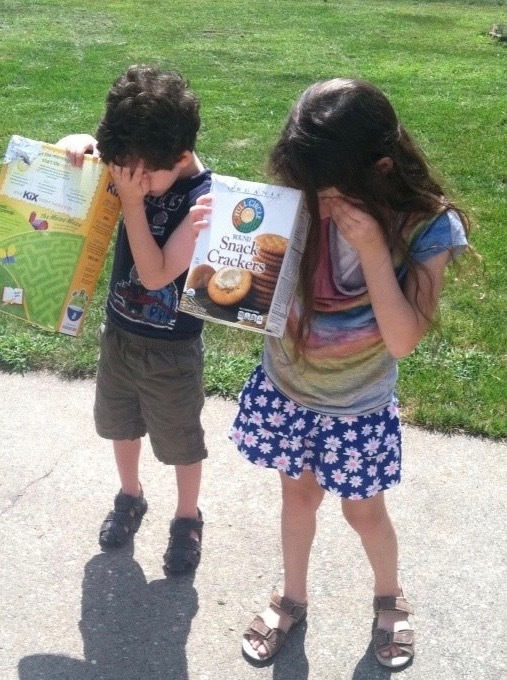 Our Wisconsin grandkids used cereal and cracker boxes to view the eclipse. You use a pinhole to let in the sunlight, and when you look at the inside of the box, you see the shadow of the moon crossing the light shining through the pinhole to the box wall. Then at the appropriate time, the Moon account unblocked NASA Sun & Space, and posted this. *Note: On Twitter, you can block an account you find offensive or bothersome. Your tax dollars at work. 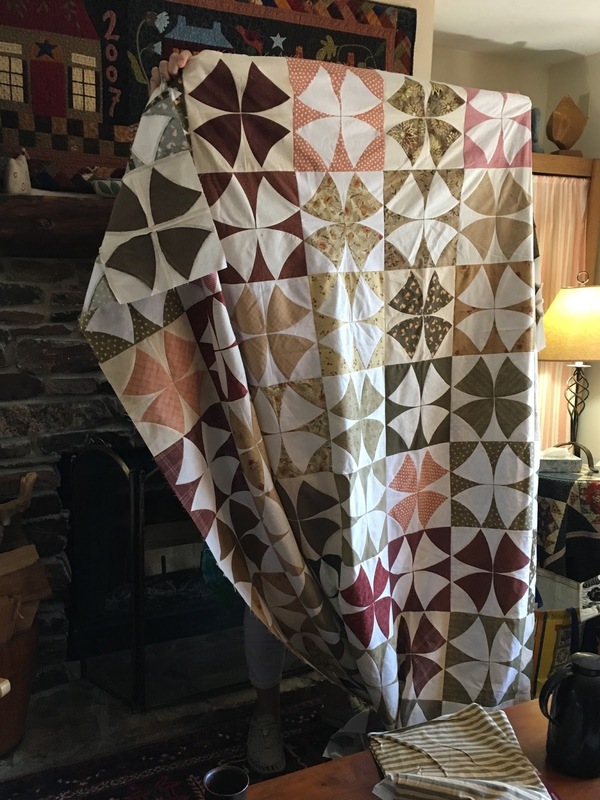 Some people on Ravelry worked the eclipse into some of their projects, such as this one, and this. We recorded the coverage (from CBS) and enjoyed watching the totality in Madras, Oregon, The Grand Teton National Park, and Carbondale, Illinois, where 14,000 people watched from a stadium as the clouds parted just in time for the maximum totality there. I feel fortunate to live in a time when we know how and when such things happen and can experience them in different ways with people from many different places. Hurricane Harvey (bless his soggy heart) landed in Texas over the weekend and wreaked (wrought?) havoc on some good friends living in the Houston area, especially my dear friend Cheryl. She and her husband were rescued Sunday morning by Houston constables and taken with their dog Fraidy to a local motel. There's a good chance they have lost everything, except each other and their pup. Prayers for them and for others affected by the storm would be welcome. I'm feeling blessed to live in an area where all the water runs off or sinks in. What's on my needles: The Gracie Cardigan in “Cotton Candy” for Vroni. What's on my Featherweight: Now clothes for the Therapy Animals of Utah doll, more test-sewing for Lilli & Fleur Couture. What's on my iPad/iPhone: Finished listening to And the Rest is History by Jodi Taylor, one of the Chronicles of St. Mary’s novel, then listened to Lady Fortescue Steps Out, another short novel by M.C. Beaton, always adventure and romance with a touch of humor. Now listening to Why Shoot a Butler, a mystery by Georgette Heyer. On the Kindle app, finally finished Undeniable by Laura Stapleton. It was an interesting premise, but I felt as if it was translated by Google Translate from another language. It seemed to go on and on, and then the ending was abrupt, as if the author ran out of pages and had to bring it to an end. What's in my wine glass: Crane Lake Malbec. Another budget wine that's drinkable. 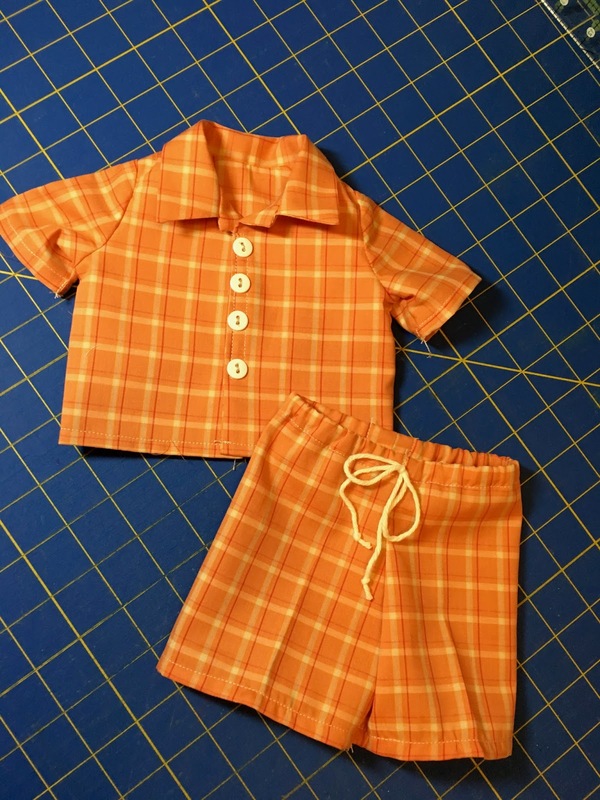 What's my tip of the week: When sewing small pieces of fabric together, whether piecing a quilt or making doll clothes, try to line up pieces in an order that allows you to avoid taking the pieces just sewn out of the sewing machine before sewing the next. 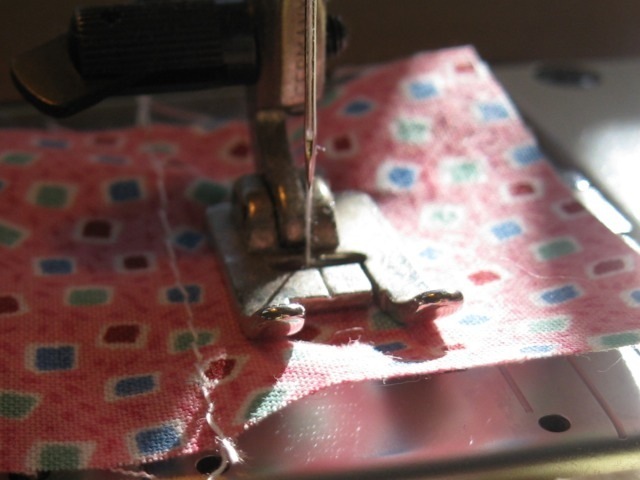 All machines sew better if the threads at the start of the seam aren’t hanging loose. They can tangle in the machine and make a bird’s nest. To avoid this, you have to use one hand to hold the threads tight, when you could use that hand to guide your fabric better. Then when you’re done with the seam, you have to pull out a lot of thread on the other end to cut it loose. With many starts and stops, you can run out of bobbin thread quickly. I’ll often sew together a section of one block, followed by a section of another block, even though I have more to do on the first block. Or with doll clothes, I’ll sew a seam in the bodice and then a seam for the skirt or pants, so I don’t have to pull out the thread and cut. If that isn’t practical, I use a small piece of fabric left over from cutting out my project as a parking place. As I finish the seam, I continue for a few stitches and then sew onto the parking place. Then when I’m ready for the next seam, I sew a few stitches and then start the seam. That's the idea, Barbara. I don't think even a Featherweight likes starting on an edge with threads dangling. Thanks for the compliment. I do sleep. I cook simply and avoid the H-word whenever I can. Fabulous as usual. I'm still convinced you never sleep. I use the "leaders and enders" technique. There is either a scrap of fabric or sometimes a second project working with the other. My old machine really hates starting on an edge. Kathleen, it's one of my favorite tips. I may have mentioned it before, but not for a long time, so it's worth putting out there again. I often chain stitch when I piece quilt blocks, but I never thought of doing a "parking place" at the end of a chained row. Makes sense! Thanks, Rebecca! My blog keeps me focused. Otherwise, the week is gone, and I wonder what I did all week. 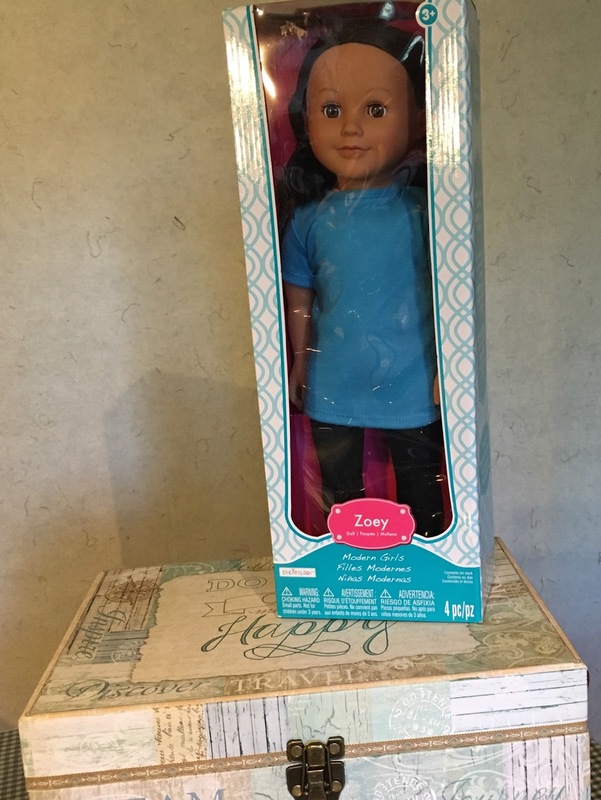 If you want Andrea's doll clothes to fit your dolls, you will need to get Gotz Happy Kidz or Classic Kidz dolls, not American Girl. Because they have knee and elbow joints, they are hard for small children to pose. They're better for ages 7 and up. Even with shipping from Europe, they aren't that much more expensive than AG dolls. I'm lucky to have groups of friends who like to do what I do. I see that the lady that you are testing sewing patterns for is Canadian. When I eventually start making doll clothes, I'll look for her patterns so I won't have to deal with the exchange rate, which is never in our favour. Beautiful patterns by the way - I did go in and look at her blog. I also watched the video of Navaho Plie(ing??) - I watched the whole thing - it was mesmerizing - I couldn't look away! Loved Marilyn's house block - very whimsical. The sun tried to come out from behind the clouds on Eclipse day, but didn't quite manage it. We were cloudy on eclipse day although the sun did try to break through right around the time of the eclipse, but didn't manage it. Great blog post again Peggy. I love Monday mornings when I get to see all the wonderful things that you and your friends have been making.